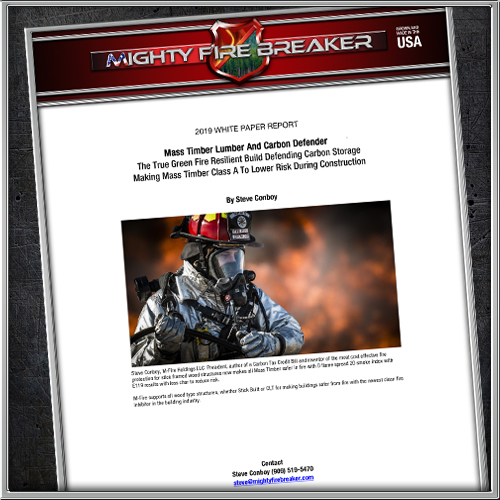 The entire building industry, including architects and engineers have heard the cries from fire fighters about early floors collapsing in fire rescue that have killed and hurt many of the Brave Fire Fighters for more than a few of decades. The MFI Resilient Movement says safety matters and solid Class A floor joist will save Fire Fighters and Tenants lives. 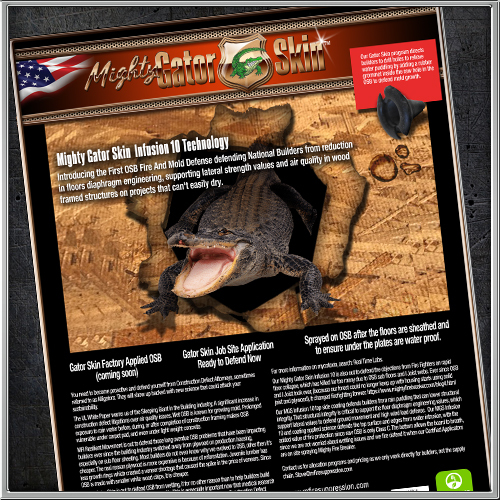 Mighty Gator Skin is out to defend OSB from wetting, if for no other reason than to help builders build healthier dwelling spaces with better air quality. This is especially important now that medical research proves that mycotoxins from mold can cause all kinds of illnesses in humans. Construction Defect Attorneys now know that new medical research has found links between mold from wet lumber and mycotoxin poison, which can create seriousillnesses in humans. Builders - Construction Defect Attorneys are sometimes referred to as Alligators you need to become proactive to defend yourself from the Litigators! They will show up backed with new medical science that could attack your sustainability. While some have tried to add mold protection to fire protection, we won’t. 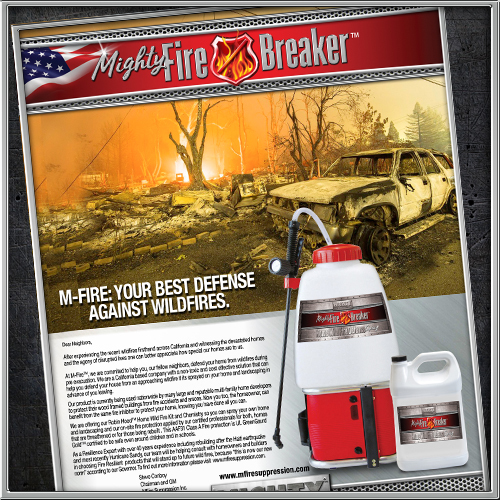 At M-Fire, we use two steps, mold treatment and fire treatment, because we will not reduce our superior flame spread and smoke index results by diluting our fire inhibitor with mold defense liquids. Both our Fire Inhibitor and Anti-microbial treatment Dual defense Applications are non-toxic with zero VOC’s making it safe on job sites without interfering with critical path schedules. 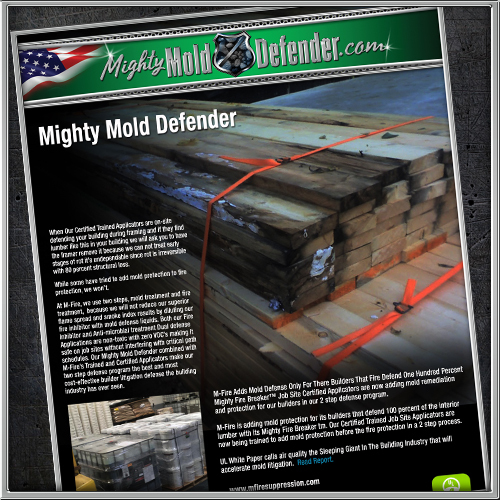 Our Mighty Mold Defender combined with M-Fire’s Trained and Certified Applicators make our two step defense program the best and most cost-effective builder litigation defense the building industry has ever seen. 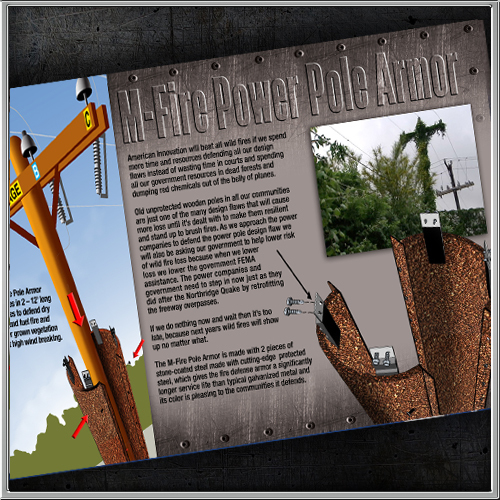 The M-Fire Pole Armor is made with 3 pieces of stone-coated steel made with cutting-edge protected steel, which gives the fire defense armor a significantly longer service life than typical galvanized metal and its color is pleasing to the communities it defends. M-Fire Clean Fire Inhibitor is UL GreenGuard Gold environmentally friendly and safe around children and schools like no other fire retardants are and that is why we can use it to eliminate wild fire embers before they get into your attic. If you live in The West you have to retrofit for wild fires to lower your rsk of catostrofic loss, much like we had to retrofit all the freeways after the Northridge Quake. One of the most difficult fires to suppress are Lithium Ion batteries. 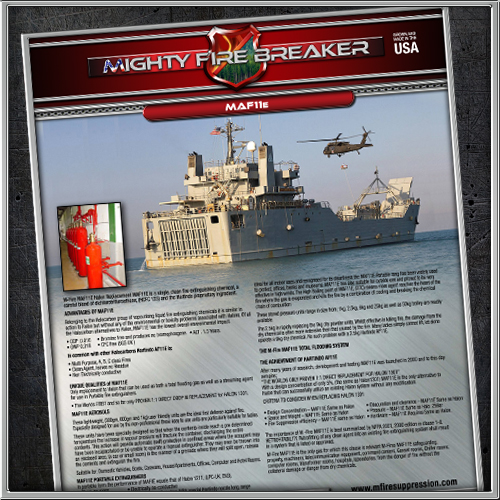 Besides Class D metal fires, few types of fires present such high risks to electronic equipment and people. An alarming fact especially when occuring 30,000 feet in the sky in a packed cabin. M-Fire suppression’s, AAF31 Battery FireBreaker is a UL Laboratories Greengaurd Gold approved formula that safely and cost-effectively suppresses Lithium Ion battery fires completely. 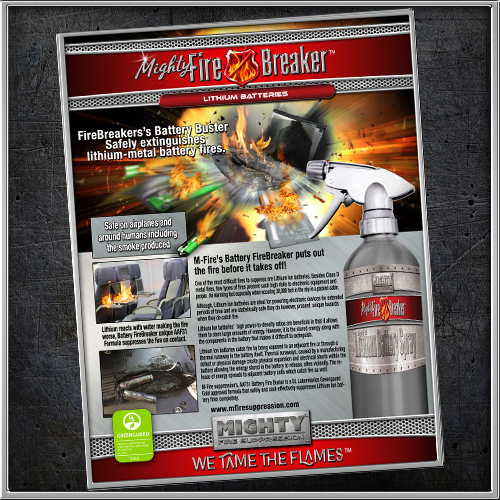 M-Fire's Mighty Fire Breaker™ patent pending Job Site Spray defends mid-size apartments under construction from fire during this "vulnerable" stage during construction and before drywall and sprinklers are in place to help defend in fire. M-Fire is now licensing pre-fab wall panel plants and modular home factories across the USA so they can offer Class-A fire protection for any type of wood building. 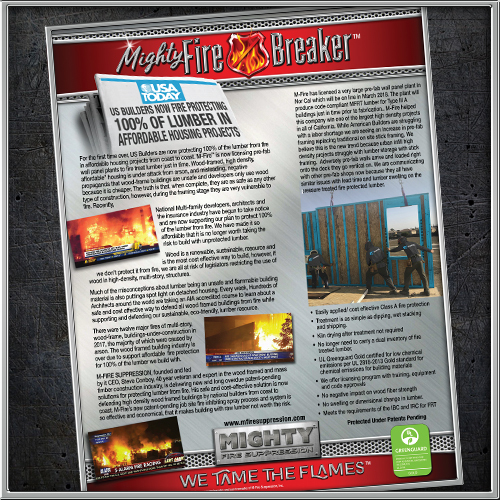 Now, with M-Fire's MFRT™ and Mighty Fire Breaker™ licensing programs its cost effective for 100% of all lumber to be fire protected. 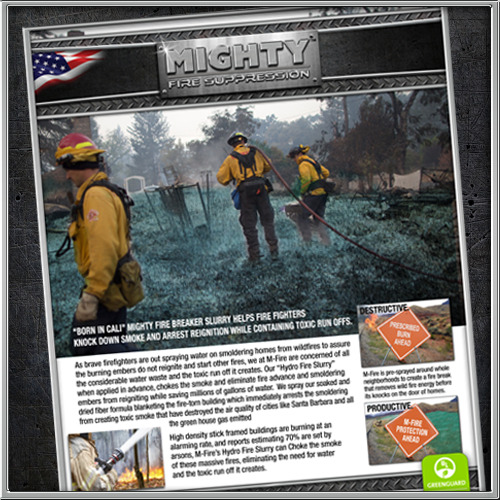 M-Fire will soon be equipping homeowners with our patent pending Mighty Fire Breaker™ Home Wild Fire Defense Kit to defend their own homes in pre evacuation, and also provide support for fire fighters who put their lives on the line to save their homes. 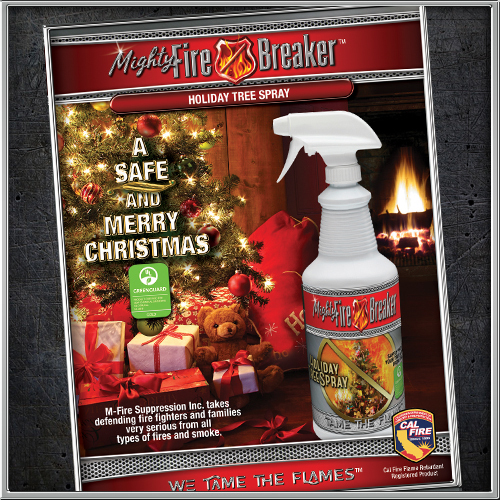 The World's safest and most effective Christmas Tree Fire Inhibitor with UL Greenguard Gold certification. After witnessing the wild fire devastation in Santa Rosa, our founder Steve Conboy was particularly affected by a man wandering the devestated property where his house of 30 years once stood. The man explained, the fire started in the hills one evening and soon after FireFighters alerted nearby homes to immediately pack and evacuate within 20 minutes as it was moving quickly. 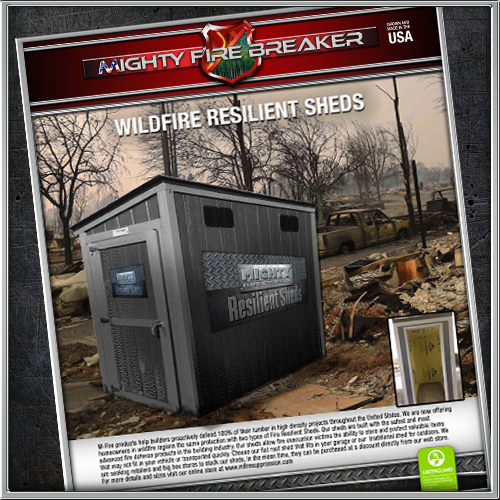 Many valuables were left behind.Realizing a need, Steve and M-Fire had a solution – Fire Resilient Sheds. These tough sheds, built with fire protected products, allow homeowners to lock and store valuables that are often left behind in short notice, due to weight or simply will not fit in transportation. We're raising the bar with our new Class-A fire-protected OSB sheathing product (Gator Skin™ OSB Panels). Addressing the serious fire and smoke risks presented by conventional OSB paneling during wood-framed building construction that has only used ineffective Intumescent Paint and Concrete Coatings. Our'patent-pending Gator Skin™ OSB Panels with its Mighty Fire Breaker™ Class-A fire-protection chemistry, adds a tough protective exterior coating making it the perfect lightweight solution for exterior walls, roof sheathing and flooring. 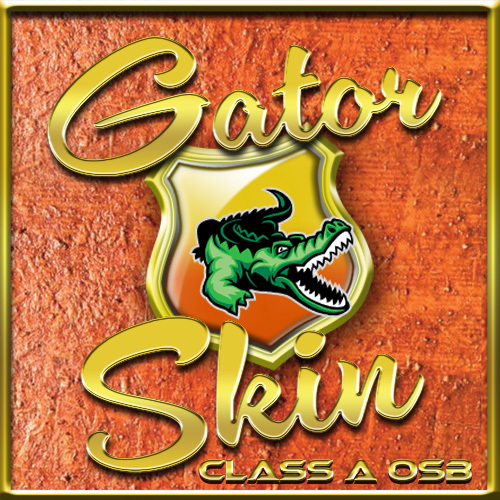 Available soon, M-Fire's Gator Skin™ promises to be a game changer with our Gator Skin™ OSB Panel Production Licensing Program. 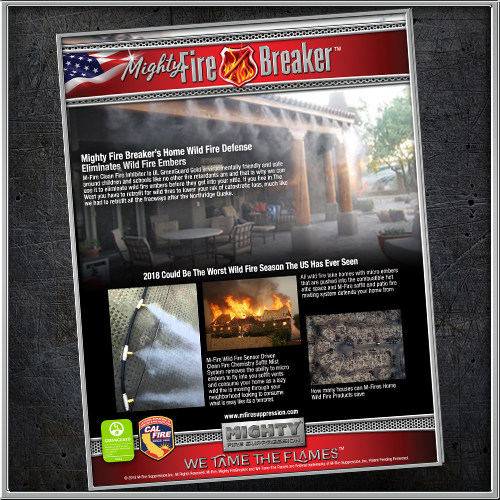 M-Fire's patent pending Mighty Fire Breaker™ Hydro Fire Slurry chokes the smoke and eliminates the advance of fire and smoldering embers from reigniting, while saving millions of gallons of water. 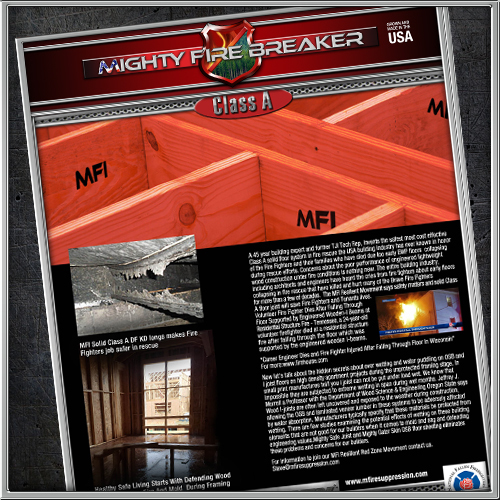 MFRT™ Class-A Fire Protected Lumber. 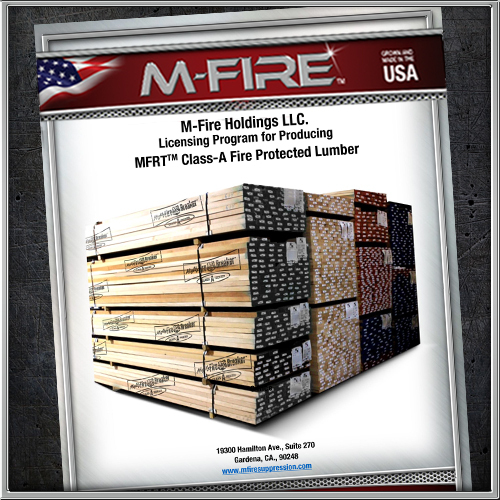 Under M-Fire's MFRT™ Licensing Program, companies can now produce MFRT™ Class A Fire Protected Lumber on demand. M-Fire has completed E84 extended fire testing on 3ply NLT with 0 flame spread and 20 in smoke index. We also offer CLT builders mold and termite protection. Engineering values and air quality in tall wood structures need defending as steel buildings need rust defense. E119 is not enough to protect the effect of fire on these structures in turn putting undo risk of firefighters and tenants. A Halon blend is any mixture or combination of substances that contains two or more Halons (i.e. Halon 1211, Halon 1301, or Halon 2402). As of the effective date, it is unlawful to newly manufacture any Halon blend. Existing stores of Halon blends are not affected by the ban. An exemption is provided for Halon blends manufactured solely for the purpose of aviation fire protection, provided that blends produced under this exemption are recycled to meet the relevant industry purity standards for each individual Halon. 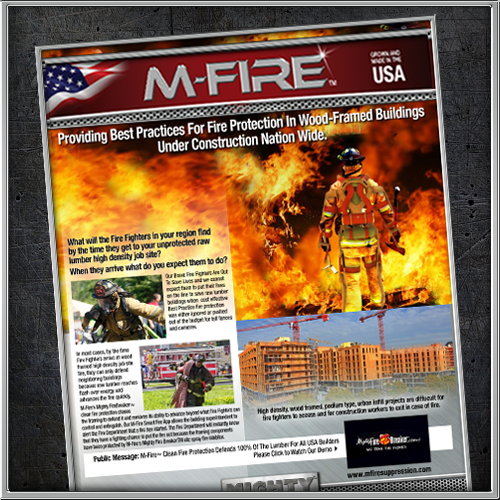 Providing Best Practices For Fire Protection In Wood-Framed Buildings Under Construction Nation Wide. What will the Fire Fighters in your region findby the time they get to your unprotected raw lumber high density job site? When they arrive what do you expect them to do? Our Brave Fire Fighters Are Out To Save Lives and we cannot expect them to put their lives on the line to save raw lumber buildings when cost effective Best Practice fire protection was either ignored or pushed out of the budget for tall fences and cameras. All of M-Fire's fire formulas have a site specific use because every blend is uniquely formulated for each specific application. This means each of our fire resilient products can only defend the product it was meant to defend per our instructions and quality assurance and no other use.